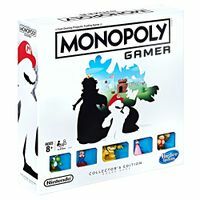 Monopoly Gamer is a special version of Monopoly with characters and attributes from the Mario universe. 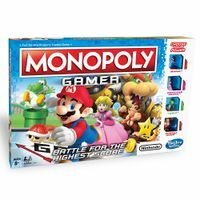 While the standard edition was released in August 2017, a special Collector's Edition with a Bowser token and a character case was released on June 28, 2017 by Hasbro. All of the areas on the board are taken from world and level names in New Super Mario Bros. U. The basic or "Standard Edition" is packaged in a standard-size "long" game box, and includes Mario, Princess Peach, Yoshi, and Donkey Kong movers as playable Characters. It also includes Character cards for all four Characters, denoting their "Super Star Abilities" and "Power-Up Boosts", the game board, a deck of Title Deeds for the 16 properties on the board, a deck of eight "Boss Battle" cards, four "Reminder Cards" with quick-start rules and definitions of the Power-Up die sides, one numbered die, one Power-Up die, 90 cardboard Coins (50 "Golden Coins" worth 1 Coin, and 40 "Five Coins" worth 5 Coins) and a Game Guide with rules. A Walmart-exclusive "Value Pack" Edition comes with all the equipment in the Standard Edition plus an additional Wario mover and Character card, and a poster with exclusive game art on one side, and reproductions of all 13 Character Cards from the various game editions. The "Collector's Edition" (initially exclusive to GameStop locations and ToysRUs.com) comes in a more squared-off and thicker box than the other editions. It includes all four Standard Edition movers plus an exclusive Bowser mover and Character Card. Most of the other components are the same except for a larger "deluxe" Game Guide and plastic Coins in place of the cardboard ones. Eight additional Power Packs have been released, each with an additional Character mover and card. The Characters released as of late 2017 are Toad, Luigi, Rosalina, Tanooki Mario, Fire Mario, Diddy Kong, Wario (who is the same as the Value Pack edition), and Boo. In all three versions of the game, there are eight Boss characters to defeat. The first seven are the Koopalings: Larry Koopa, Morton Koopa Jr., Wendy O. Koopa, Iggy Koopa, Roy Koopa, Lemmy Koopa and Ludwig von Koopa. In the Standard and Value Pack editions, the final boss is Bowser. Since Bowser is a player Character in the Collector's Edition, he is replaced by Bowser Jr. The "GO!" space prompts the player who lands on or passes it to receive 2 Coins from the Bank and initiate a "Boss Fight" by flipping over the top Boss Card on its pile. There are no Community Chest or Chance spaces. In their places are four Super Star Spaces and four Warp Pipe Spaces, one of each on each side of the game board. Landing on a Warp Pipe Space lets the player move their character to the very next Warp Pipe space on the board. The player also collects any dropped coins on the spaces between those two Warp Pipes and on the landing Pipe (not from the departing Pipe). The Railroad Spaces are replaced by two ? Block Spaces (one between the Brown and Light Blue sets, and one between the Red and Yellow sets) and two Thwomp Spaces (one between the Maroon and Orange sets, and one between the Green and Dark Blue sets). Landing on a ? Block Space lets the player roll the numbered die and collect that many Coins from the Bank. Landing on a Thwomp Space forces that player to drop two Coins on that space. Red Shell: Choose any player to drop 3 Coins on their current space. Green Shell: The next player on the board (from your position) drops 3 Coins on their current space. (If more than one player is on the space, the player chooses who drops the coins). Blooper: Steal 2 Coins from any player. POW Block: All other players drop 1 Coin on their current space. Coins: Collect 3 Coins from the Bank. In addition, depending on the Character a player is using, the Power-Up may get a "Boost", as listed on the Character card. Each character has a unique "Power-Up Boost" assigned that may be activated when the listed Power-Up is rolled; for example, if the player playing Mario rolls the coins side on the Power-Up die, he gets 4 coins instead of 3. This page was last edited on April 10, 2019, at 13:39.